I've been wondering whether to do anything with this whole 12x Epic Story XP boost that's going on right now. I've said a hundred times that I'm not a fan of things like double XP weekends, but I think I've made my peace with the fact that they exist and that there is a clear demand for them. At least they are preferable to changing XP requirements across the board and thereby forcing fast levelling on people. This time Bioware also remembered to give people an option to turn the whole thing off, so all is well from my point of view. Personally I have little incentive to level another alt as quickly as possible. I enjoy levelling in general so I don't really want to rush it, and I've seen all the class stories. There's a certain draw to repeating some of them to see a slightly different outcome, but then I ask myself: "Do I really want add another max-level alt to my stable on The Red Eclipse?" For some reason having too many unplayed alts makes me feel vaguely guilty. No, I don't think that makes sense either - it is what it is. But then I saw someone make a suggestion for an alternative use of this XP boost (sorry, I forgot who exactly it was): use it to level a character on another server. This has been one of those goals that has been at the back of my mind for ages, wanting to have the ability to visit friends on other servers and play with them, but somehow I've never been very good at this. I've tried in the past, but usually I just faff around on the starter planet for a little while and soon end up logging off and never coming back. I figured that giving myself a bit of a push, so I would quickly get to the point where I could actually found a new legacy, would help me to maintain momentum, and it has. Oddly, I was immediately struck by just how long it's been since I started a character on a new server with zero support. I was kind of surprised when an achievement popped up for killing people in the starting area on Hutta, because on the Red Eclipse I have so many achievements that I rarely see one these days outside of new boss kills in ops. I also realised that I'm terribly ignorant about which features are actually account-wide and which ones only legacy-wide. For example I immediately had three bank tabs unlocked, but barely any inventory space. While my mailbox was full of crap the usual "gifts", I had no stronghold to admire my furniture in, or legacy perks that would have allowed me to fly a speeder early. Bhagpuss wrote about the joy of starting fresh on a new server the other day (in the context of Everquest), and I can definitely recognise myself in that a little. I've become too spoiled by my big, fat legacy. There is fun in being a scrappy noob. 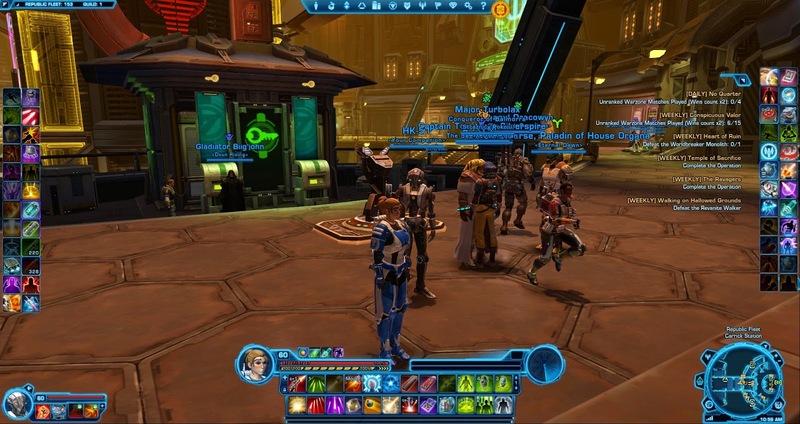 Of course even a scrappy noob feels a bit overpowered in SWTOR these days. I had forgotten that training new skills is now free for subscribers forever, and it feels like cheating. Don't I have to spend money on anything while levelling up? And the XP gains from my class quests on Hutta were utterly ridiculous of course. Sometimes I even gained two levels at once from a single quest hand-in. I feel like levels really start to lose their meaning at that point. I did all the quests anyway and was level fifteen (going on sixteen) by the time I left Hutta. I was too high level to queue for the Black Talon before I even got to it! I decided to solo it for fun, even if it granted me little XP. I was hoping to be able to scavenge some metal, but I forgot that unlike during its Republic equivalent, the Esseles, you hardly fight any droids in this flashpoint. I think I counted a total of five. It was also noticeable that my companion wasn't beefed up by tons of presence bonuses, as things actually took a bit of time to kill. I also did a lowbie warzone, which seemed pretty flooded with lowbie agents of some flavour or another, and got eleven achievements in a single match. Operative healing feels extremely powerful in lowbie PvP now that they get Kolto Probe so early. Oh yeah, did I mention that I chose Operative over Sniper (again)? Being able to just choose my advanced class from the UI certainly made things more convenient at the end of Hutta, but I did the little "choose your advanced class" quest on the fleet anyway once I got there. I wonder if new players find that confusing. I remember when ships in flashpoints going into Hyperspace used to crash my game. Good times. We'll see whether I'll actually be able to progress, get distracted by side activities while ignoring the XP boost, or lose interest if my character levels too quickly (seemingly without me actually doing much of anything). I'll say it right away: This post has nothing to do with Episode II. Sorry if you came here thinking that it would. The title was just too appropriate not to use. A long time ago, I saw a video on YouTube that was bashing SWTOR pretty badly. I can't find it anymore, but it was very straightforward really. The video-maker was running around the Imperial agent/bounty hunter starter area on Hutta and accusing Bioware of being lazy and of having created a dead and uninteresting world. His evidence? The NPCs in front of Nem'ro's palace were all the same. Not literally all of them of course - but as he was walking around, he pointed the camera at various citizens that were strolling around the area, talking to vendors etc. and there were indeed a lot of clones among them. The guy sounded so bitter and hateful that I found it easy to ignore him and to dismiss his criticism. After all I had already been playing the game for a while by that point, and I'd never noticed anything like that. I figured that it was probably footage of placeholder NPCs from beta or something. I kind of forgot about his whole argument until late last year, when my guild was getting really into conquests. 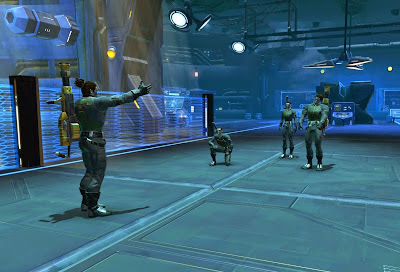 Initially, one of our main sources of conquest points was grinding low-level heroics on multiple alts, which worked particularly well on Nar Shaddaa. As I was mindlessly killing the same mobs over and over again, multiple times a day and for several days in a row, I couldn't help but get a closer look at them. 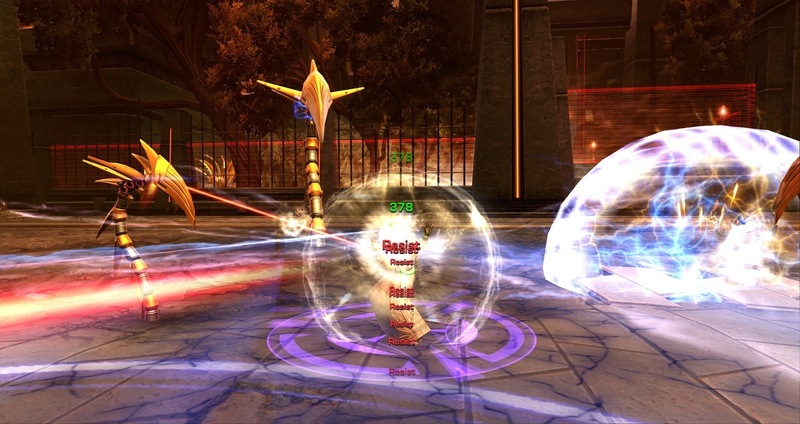 Since they were low level compared to my characters, they posed no threat and combat required no real attention. So instead I started to notice... similarities. The thing is, to a certain degree I honestly expect lots of mobs to look similar. 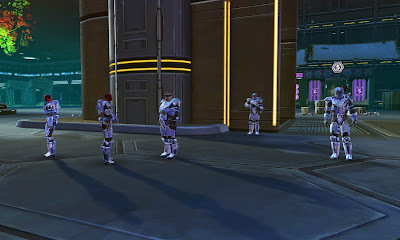 In SWTOR, we spend a lot of time fighting enemy soldiers of a certain faction or another, and it's no surprise that people in uniform or heavy armour all look kind of same-ish, especially when you're more focused on selecting the right abilities than on inspecting them up close. 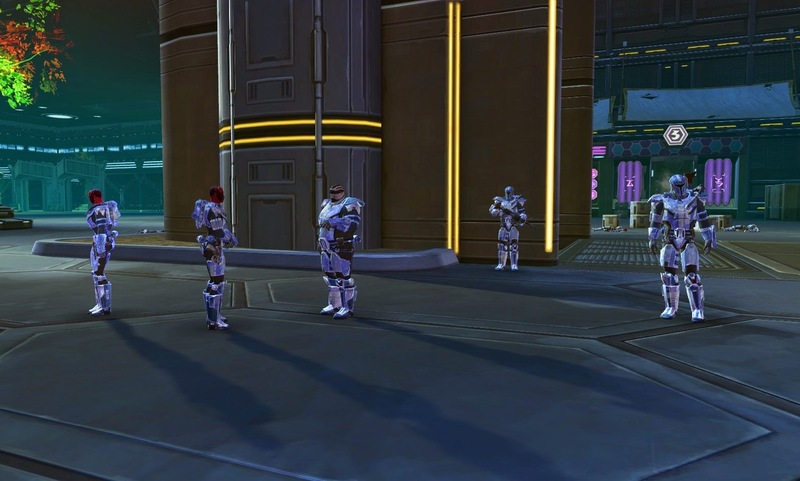 But as I was grinding those heroics on Nar Shaddaa, I started to notice things that looked a bit odd to me. 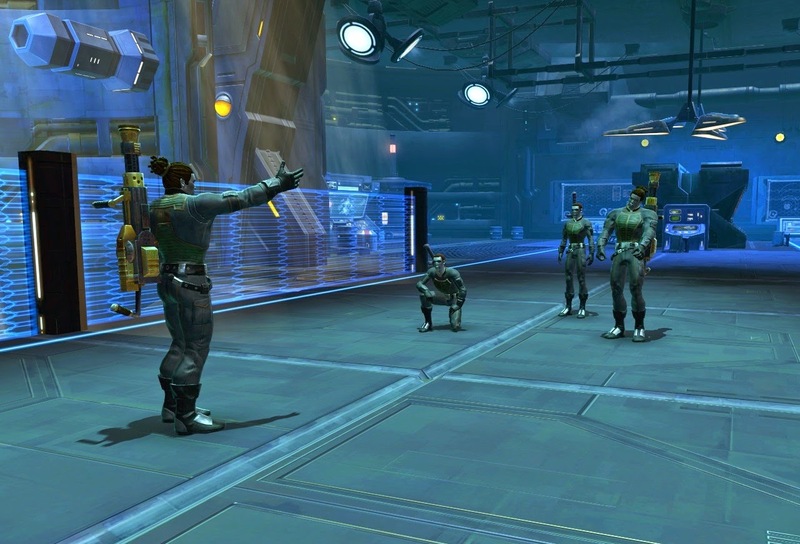 For example the [Heroic 4] Mandalorian Rage requires you to kill a lot of Mandalorians from Clan Sharratt. Especially when they have a helmet on, it goes without saying that a lot of them will look the same. 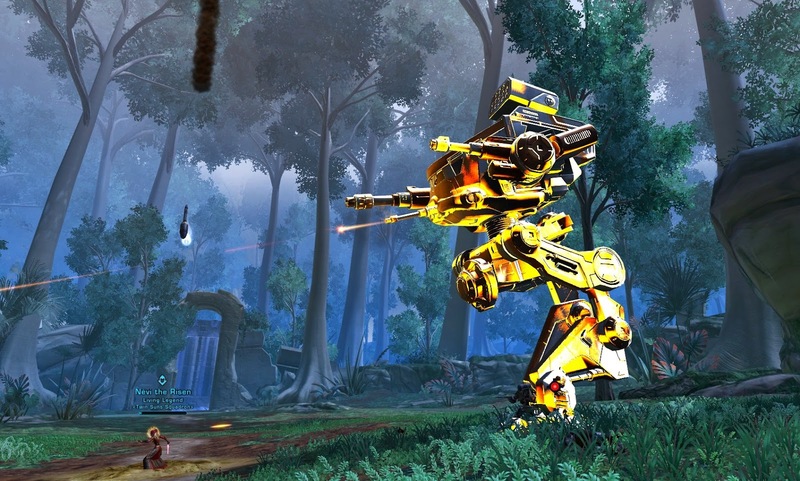 But I noticed things like that all the mobs called "Clan Sharratt Vanguard" were female Zabraks with red skin. That's a rather striking look, and when there are two of them in each pull it looks rather odd. 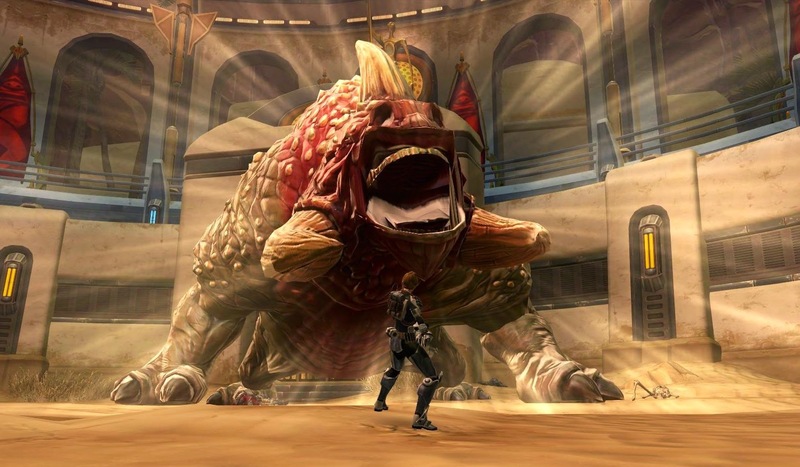 A similar thing caught my attention in the [Heroic 4] Lab Animals, where you fight some bad guys called Xenobi. 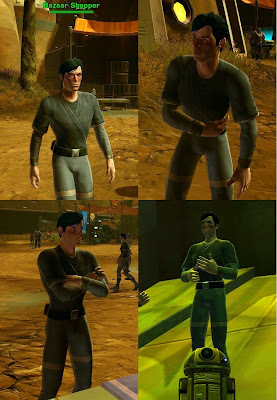 The Xenobi thugs were all body type one (or two, not sure now) with short hair so not particularly eye-catching, but the ones called rangers were all body type three and had that wacky haircut that Corso Riggs comes with by default. All of them. It was slightly disconcerting. After that I started to notice the same pattern pretty much everywhere I cared to look: Bioware would make a bunch of different mobs with different names and mix them up in larger mob groups, but every mob with the same name would look exactly the same. I won't pretend that this bothers me very much, because most of the time when I'm in combat I'm busier with focusing on my survival than on inspecting the facial features of some random NPC, and I rarely go to low level areas to mow down mobs that can't really fight back (that heroic grinding for conquest purposes was definitely an exception). But every so often when Bioware gives one of these generic mobs a more striking look, with an unusual skin colour or a funky haircut, I notice it again. I even went back to check on Hutta, and the YouTuber whose name I can't remember was actually right. 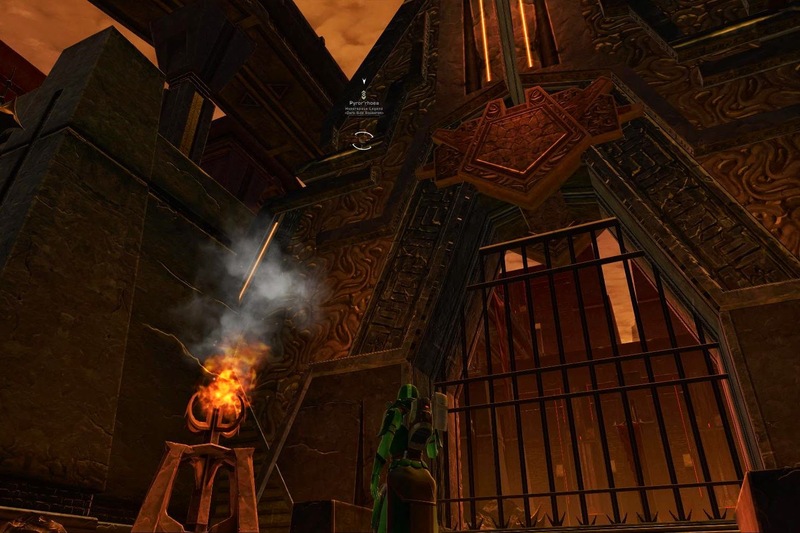 That same NPC is still there, playing a whole plethora of roles in front of Nem'ro's palace. I'm just wondering: Who else has noticed this? And if you have, does it bother you? I'm kind of thinking that in theory, I would like a world where no two NPCs look the same, but I'm not sure how much additional work that would create for the artists. I'm kind of doubtful it would be worth it, when even long-time players like myself can take almost three years to actually take a close enough look to notice. I kind of have a suspicion that Galactic Starfighter was more or less intended to replace the original space game, which is why they stopped updating the latter. Of course it's a bit questionable to replace a PvE game with a PvP one, and while GSF has found its fans, I wonder how many players actually migrated towards it from the original space combat. Of the aforementioned two fans I mentioned, only one really took to GSF as far as I know. At least the original space missions are still in the game, and most players probably give them a try at least once, considering how prominent that quest icon is on your starship. The fact that space combat has never been relevant to any other parts of the game actually has the advantage of making it timeless. This one might seem a bit odd at first, considering that we probably spend a fair amount of time looking at our legacy window to check things like achievements or reputations (all of which are legacy-wide). What I'm talking about however is legacy as something other than a simple accumulation of character perks. Remember legacy levels? I have to admit I almost forgot that they exist, considering that I hit legacy level 50 over two years ago, which caused my legacy experience bar to disappear. I'm sure I'm not the only one who expected these to gain some sort of purpose eventually, but they never really did. 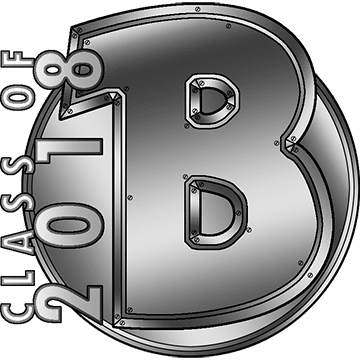 The maximum legacy level has also never been raised, even though the maximum character level has gone up to 60 in the meantime. Or how about that family tree? I have to admit I always thought that it had some potential for roleplaying additions, but Bioware never really did anything with it. I would have loved to be able to connect it to the characters of other players! 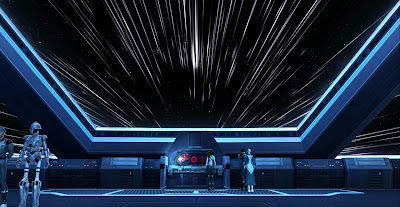 Basically, the legacy system originally appeared to be something that could really allow us to build our own story in game and build stronger connections between our characters. However, nobody has really shown any great interest in taking it in that direction in the last two years, neither the devs nor the players. It still has its role to play as a point to collect achievements and certain character perks, but I can't help but think that it could have been - and could still be! - so much more. The first time I actually felt compelled to hunt datacrons in the game was when I built my first matrix cube. At the time, good relics were pretty hard to come by, and none were better than this simple item that you could build yourself... even if it did require some effort. 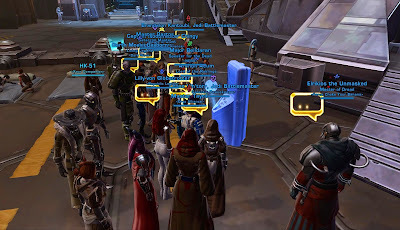 These days, I like to pick up as many datacrons as possible whenever I level a new character - but sadly all those matrix shards effectively go to waste, as Bioware never added new matrix cubes for level 55 or 60. Why not, I say? I'm not saying that these new matrix cubes would have to be best in slot, but having new versions of these at all would offer players at least an alternative way of getting something for that particular gear slot. 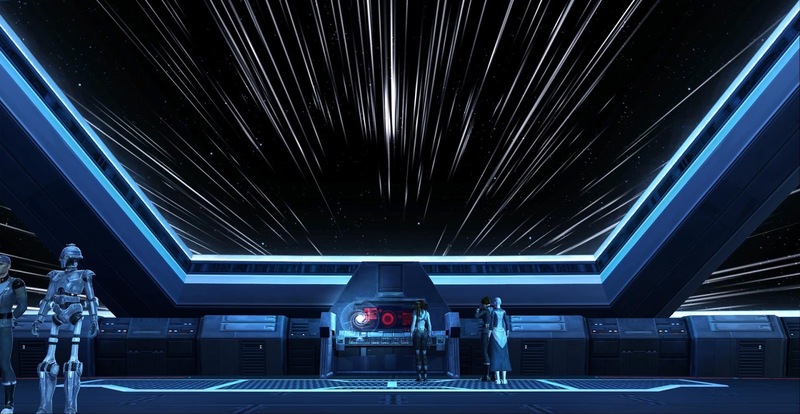 I find it strange that while Bioware keeps adding datacrons to give people stat boosts (and players embrace them, with all their crazy jumping requirements and secret puzzles), this secondary function of datacrons seems to have been all but forgotten. Would you like to see any of these features updated and added to? Or can you think of other parts of the game that both devs and players seem to have forgotten about? So, five days ago, on Star Wars Day, we were allowed to see the conclusion to the Ziost storyline. (Spoilers this time if you haven't seen it yet!) There was a big crowd of people at the mission terminal that couldn't wait to see it. As soon as you click it, you get a message that some sort of anomaly has been detected on the planet... and then you get to see Vitiate "consume" it by killing every living thing on the planet. Talk about a shocking moment, especially since the story up to that point had ended with NPCs expressing hope that maybe the former* Emperor wasn't as powerful as they thought. People have pointed out that the whole thing is reminiscent of something that is talked about in the Revan novel, how Vitiate consumed all life on his home world to make himself immortal. If this was indeed a similar sort of thing, he only just got even more powerful. 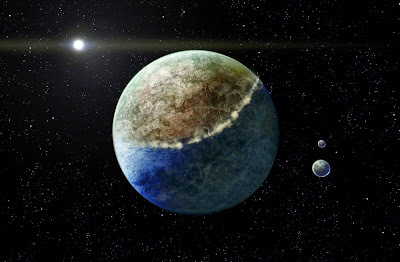 Personally I was also reminded of an event in the early Jedi knight story - it's been a while, so I don't remember all the details, but basically you get sent out to save a planet from an evil superweapon and arrive too late, which cumulates in a moment of shock similar to this one as everyone stares down at the planet's destroyed surface. Finally, the whole thing is an interesting contrast to Makeb, where the threat of the planet's destruction is dangled over your head for the entirety of the storyline, but it isn't very credible and it's unsurprising that it never bears out. In hindsight, it makes a lot more sense now that the quest areas on Ziost felt so tiny, considering that they literally only existed for the purpose of progressing the one story quest. Ziost's "permanent" state is that of a dead planet. There aren't even any mobs down there, except for a couple of giant Monoliths (alchemical Sith creations), which you are better off dodging than fighting if you are on your own. The quests are once again pretty varied (they kind of have to be, with no "ten rats" to kill), and the mission with the speeder bike ride was pretty fun. I was quite annoyed though when the one with the Macrobinoculars bugged out on me and my pet tank when we tried to do it in a group and we were forced to reset it and drop group to be able to complete it. I just can't help but see this as another sign of Bioware's decreasing interest in making their content group-friendly. Even though the new dailies were a fun little romp, I also couldn't help but wonder why I should keep doing them. There is no new reputation or anything attached to them, so the only rewards are commendations and some new tokens for another set of orange gear with blue mods. As a raider, I have commendations coming out of my ears and the last thing I want to do is get more of them. I occasionally use them to buy gear for a rarely used alt or a companion purely because I don't like being capped, but other than that I really have no use for them. I guess people who don't do endgame group content may appreciate another way of upgrading their gear a little. What I probably found the most interesting though were the Colossal and Worldbreaker Monolith bosses. 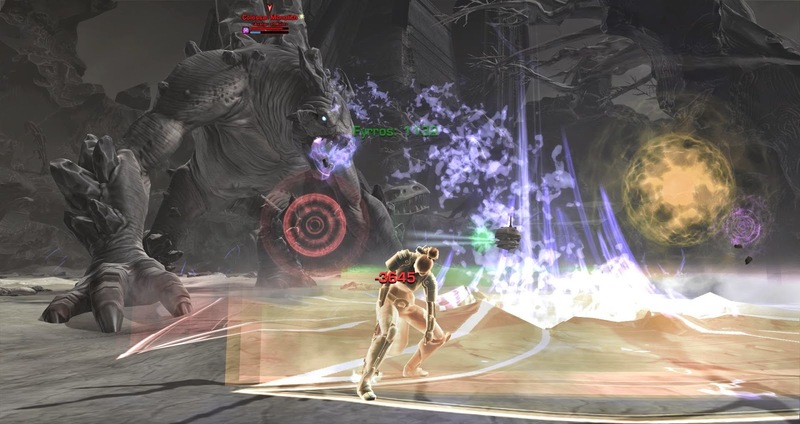 Bioware has a history of experimenting with world bosses: giving them long respawns, then shorter ones, putting them in instances, then putting the next one outside again, and so on and so forth. The two Monoliths definitely feel like another step in this ongoing experiment, since one of them is a world boss and the other one is inside an instance (an operations boss). The weekly requires you to kill both, and to tackle the Colossal Monolith on hardmode you're supposed to have a buff which you only get from killing the Worldbreaker Monolith beforehand. I thought this sounded immensely annoying at first, considering my bad luck with ever seeing the Yavin world boss out in the open, but fortunately Ziost spawns lots of instances quickly due to its small size, and even if another group just killed the world boss before you, he respawns after only fifteen minutes. 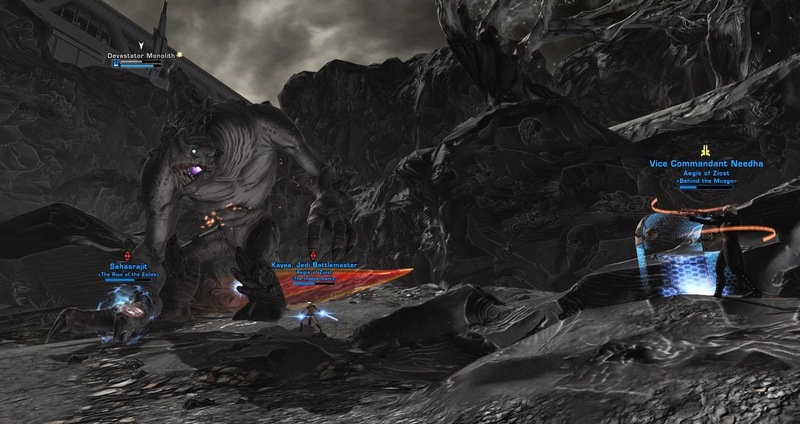 I also thought that the Worldbreaker Monolith was the more fun boss of the two in terms of mechanics. He spawns three adds that can't be killed and make him invulnerable to damage while even one of them are active, but if you get their health low enough, they go into a "stasis" for about thirty seconds during which you can actually damage the boss. What makes this fun is that it's vital that you co-ordinate dps on the adds or you'll end up with a "rotation" where at least one of them is always up and you can pretty much never hit the boss. The first time I pugged this fight and nobody knew what to do, we actually managed to have the boss enrage on us, which was pretty funny. 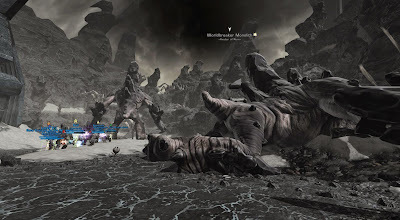 I've been less impressed by the instanced boss, the Colossal Monolith. He feels like just one more giant circle dance... and somewhat ironically, the current recommended strategy for killing him on hardmode seems to be to ignore his main mechanic and just AoE heal through the whole thing. 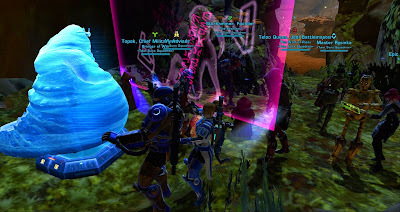 My small guild group certainly didn't have much luck on our first night of attempting him on hard and trying to actually execute the circle mechanics correctly. But then again, considering that he's supposed to drop a mainhand better than what you get from harmode Revan, I would expect him to be something of a challenge. * On a side note, I thought it was interesting that it took until Ziost for the Empire to fully denounce the Emperor, and Lana insisting on calling him Vitiate felt quite poignant. Makes you wonder about the Empire's future though - there must be a huge power vaccuum now that no single person is officially in charge of the Empire anymore. Surely more than one Dark Council member must be more than eager to fill that role, wanting to become the new Emperor?